Like the old saying goes: if you repeat a lie often enough, people start believing it. One of the biggest, most prolifically shared lies in Wyoming today is that our state can afford higher taxes. We can't, and it doesn't matter how reputable the person is who keeps suggesting otherwise. The most recent iteration of the argument for higher taxes comes in the form of a column over at WyoFile. The author is none other than Mike Madden, former House chairman of the Joint Revenue Committee and a retired economics college professor. Already here, Madden sounds like he is back teaching principles of economics. I have done that, too, but unlike Madden I have also left the classroom behind me. Textbooks in microeconomics (which is where Madden appears to be specializing) are so stylized their material can rarely be directly applied to the real world. That is not to say the stuff you learn there is entirely useless - there is price theory and there is a lot of good institutional theory about market structure, and you do begin to learn to think like an economist. However, the leap from the elementary textbook material to the real world is formidable, especially for someone who does not link microeconomic behavior to the macroeconomic performance of the economy. To omit that link is to fall victim to the fallacy of methodological atomism: somewhat crudely, you believe that the world consists of "atoms" isolated and independent of each other. Well... fallen massively is a bit of an exaggeration. 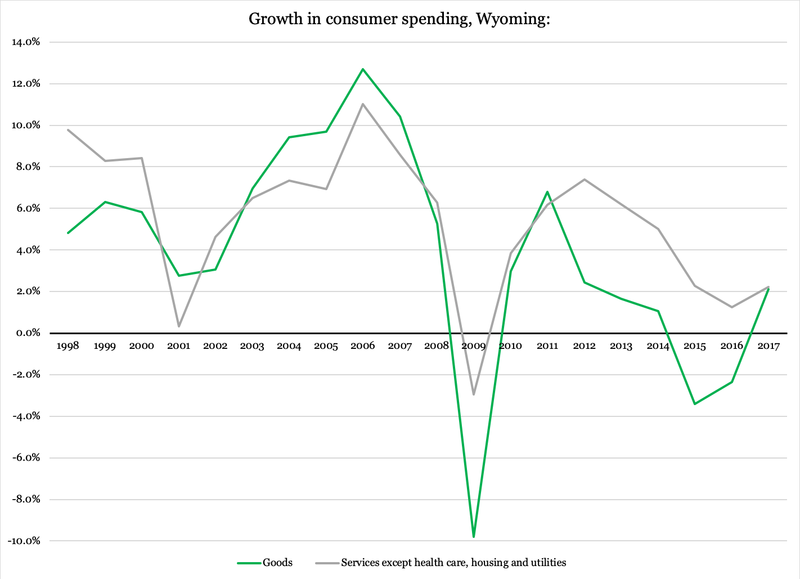 Over the past 20 years, consumer spending on goods here in Wyoming has actually increased by, on average, 3.9 percent per year. 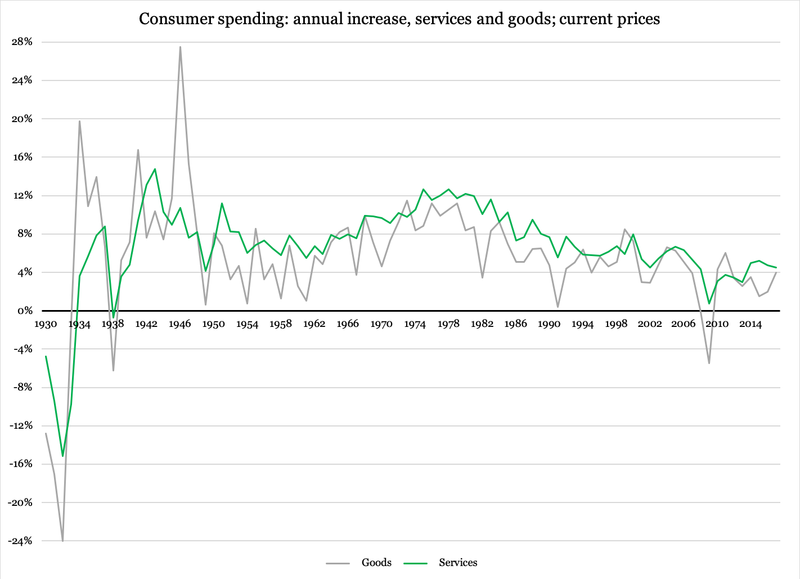 For sure, services consumption has increased faster, at an average rate of 5.6 percent per year, but that does not mean it is fair to call the slower growth rate as spending on goods having "fallen massively". ...as a matter of fact, consumer spending on both goods and services has increased almost uninterruptedly since the Great Depression. In fact, since 1938 there has not been a single year where services spending has declined. As for goods, the streak of growth was uninterrupted for 70 years, from 1938 to 2008. After two years of decline in the Great Recession, spending on goods picked up again and has remained positive ever since. Hard to call this a "massive fall", isn't it? Unfortunately, Madden is not doing much better when it comes to the shares of goods and services spending. Back in the late 1970s - the "40 years ago" he refers to - approximately 48 percent of consumer spending went toward goods, with 52 percent being spent on services. To find the 60-40 split he is talking about we have to go back to the end of World War II. We have all read about the new service economy — its jobs, its growth. And we also know how our own household budgets contrast with our parents’ spending during our early lives. Households of 30 to 40 years ago didn’t spend money on internet service, satellite TV, cell phone plans, airline tickets, landscaper services… the list goes on and on. What does this mean for the viability of Wyoming’s sales tax structure? Our state has one of the narrowest sales taxes in the nation with relatively few services taxed. The last point is actually somewhere in the vicinity of reality. As for the composition of services spending, there are two things we need to keep in mind. (A) Agricultural services including landscape consulting and planning, lawn and garden services, other agricultural services that are not otherwise classified and veterinary services except veterinary services provided for farm or ranch livestock; (B) Personal services including beauty shops, barber shops, tax return preparation services and other personal services that are not otherwise classified, provided that personal services shall not include funeral or crematory services; (C) Business services including commercial art and graphic design, court reporting services, disinfecting and pest control services, building maintenance services, computer programming services, data processing services and other business services that are not otherwise classified, provided that business services shall not include legal services or banking services; (D) Amusement and recreation services including dance studios, dance schools, dance halls, bowling centers, physical fitness centers, public golf courses, membership sports clubs and other amusement and recreation services that are not otherwise classified; and (E) Engineering and management services including engineering services, architectural services, surveying services, accounting, auditing, bookkeeping, commercial research, testing laboratories, management services, management consulting services, facilities support services and services of real estate agents and managers. In addition to legal services - conspicuously absent this year compared to last year's version of the same bill - HB67 does not appear to include health care, housing and utilities. Housing will be affected by the sales tax on management and facilities support services, but apartment lease itself is not taxed. If we make the one simple assumption that health care, housing and utilities are exempt from the sales tax, and we follow Madden's line of reasoning that consumers need to pay a tax on their purchases of services, then the services tax base that remains available for Madden is quite a bit smaller than what he otherwise suggests it is. The problem for Madden (in addition to his crafty approach to reality) is that he opens his article at WyoFile by suggesting that we spend much more on services than on goods and therefore need a tax on services. At the same time, the services covered by his bill - HB67 came about on his Revenue Committee watch - nowhere nearly applies to that chunk of consumer spending. In fact, if we deduct health care, housing and utilities from spending on services, we lose about half the tax base that Madden points to. In fairness, there are many exemptions from the sales tax on the goods side of spending as well. Food is a good example, accounting for just over one quarter of all consumer outlays on goods. Nevertheless, if we are going to use trends in consumer spending as an argument for a sales tax, then we shall stick to those trends. Most important among those trends is the fact that the base for our state's sales tax as it is today has not been shrinking over time. It does not help that Madden repeats that "our commodity driven tax base has been shrinking slowly but surely for years." Madden's real problem - one he shares with the entire Revenue Committee - is that it has not been growing fast enough to keep up with the growth rate in government spending. When considering all new elements of the bill, the state sales and use tax can be reduced from 4 percent to 3.5 percent. During the final interim committee hearing on the bill, witnesses liked the reduced tax rate, but had reservations on taxing certain services — especially those services that involved themselves personally. But we can’t have the former without the latter. It is critical that citizens understand the reduced sales tax rate of 3.5 percent is only achievable if the broadening aspect of the bill is not significantly diluted with special interest amendments. What he carefully avoids telling us is that this is just the state sales tax. Once it goes into effect, we will also be paying local sales taxes on services. This increases the actual tax rate to up to seven percent, depending on where in the state you spend your money. Hereby, another one of Madden's implied arguments for the services sales tax falls apart. There is this idea behind HB67 that the lower tax rate will make the expansion of the sales tax "neutral". It is not clear what type of neutrality he is referring to; as I explained back in December, there are different definitions of "tax neutrality", and the Revenue Committee has to choose which one they are pursuing. The cut in the tax on Product A is supposed to offset the increase in the cost of Product B. The only problem is that after having kept track of tax reforms, nationally and internationally, for more than 25 years, I have yet to find one reform that was successful in meeting this definition of "revenue neutrality". Perhaps Madden has some examples to share? I suspect that the only reason why proponents of HB67 bring up the neutrality argument is that they want to ease concerns about rising costs to consumers and small businesses. Those concerns are valid, and it does not help that we continue to witness a troubling lack of stringency in terms of facts and analysis from proponents of bigger, broader and higher taxes. Wyoming cannot afford higher taxes. As I explained recently, our government spending keeps growing even when the tax base - in its broadest possible interpretation - is shrinking. And right there, my friends, you have the real problem for our legislators to deal with.